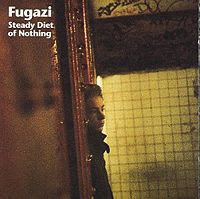 Like you, this was the first Fugazi record I ever heard. Also like you, I wasn't immediately in love. I really loved "Exit Only" and "Stacks" upon first hearing but it took awhile for me to warm up to the rest. I am pretty sure it was only after I listened to "Margin Walker" and "Repeater" 150 times and needed something new. My problem with this one has always been side one. It really is not their best work. I have always thought that if they just would have swapped the sides that this record would have been much more appreciated. Can you imagine if it kicked off with "Long Division?" Critics would have lost their minds. "Reclamation," "Nice New Outfit," and "Latin Roots" have always been some of my least favorite songs in Fugazi's catalog. I can't explain it, they just are. Also, you left out "Steady Diet" which is a pretty sweet instrumental that on the cassette copy faded out side 1 and faded in side 2. I always thought that was pretty sweet. "Polish," "Long Division," "Runaway Return," and "KYEO" are just monumental songs. All in all though this album has always stuck out as just not quite sounding like them. I really want to get the remastered version of this as I think it might help the songs sound more "Fugazi-esque." When I was 14 I thought that "America is just a word but I use it" was the greatest lyric ever. I also wrote "Exeunt" under my name on everyone's 8th grade yearbooks. How cool I was.